Each year around the beginning of December, from the time our son, Dillon, learned to write up until the time he was in college, he would reverently present us with his yearly Christmas Wish List. This was a family tradition his dad, Steve Hulse, and I enjoyed immensely – we’d pour ourselves a glass of wine and settle in for the reading of this well-written, often hilarious, yearly missive called, THE LIST. This wasn’t just some numbered list in crayon, mind you – no, this was a veritable treatise on the virtues of each enumerated item for which he so yearned. He took the time to really define what was important to him each year, because he knew only a few things would be under the tree. THE LIST included Dillon’s things hoped for in order of priority, followed by the explanation/argument for why he should receive this particular toy, movie, game, action figure, etc., complete with subheadings, like Why it’s cool, Where it’s at and Cost. Geez, what a kid, making it easy on the parents! Now, perhaps your children have presented you with their Wish List for Christmas or Hanukkah. I’m talking about your Wish List for Life. 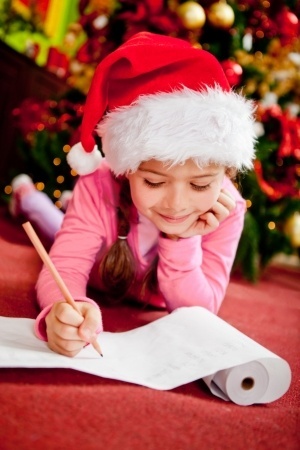 Can you think of your Wish Lists from childhood? What toys sounded like fun? What was it that made you happy? Ever wish for a pony or a fancy bike that seemed like an impossibility at the time? Do you remember what it felt like to write the list or letter, then drop it in the mailbox, addressed to the North Pole? Or, to sit on Santa’s lap and whisper your list into his ear? Remember the eager anticipation of believing that the wishes on that list would be fulfilled? Will you do that right now? Sit down and make a list of things or situations that would make you happy, make your life better. Things that are fun, things that fill in the missing pieces of your purpose – a BIG list of wishes for YOURSELF that maybe up till now might have seemed improbable, if not even impossible. Now, breathe some life into those wishes. What’s great in your life right now – and, how can you have more of it? What does your life look like with that Wish List for Life fulfilled? Can you see it, smell it, taste it, feel it? Does it feel like YOU? What’s important to you about the wishes on the list? What’s kept you from having them in the past? What’s different now? What inspired action can you take right now to make those wishes come true? Bring to mind your many strengths that will serve you to follow through on those baby steps and keep the vision alive. You’re used to making wishes come true for everyone else, especially at this time of the year. You CAN have the wishes on your Wish List for Life. And, you are THE one who has the power to make it so. I love this article! I know I can have my wishes filled, the Universe is an abundant “thing”. I appreciate that you encourage the Wish List for Life, it truly matters that we write what makes our hearts sing, and our feet dance with anticipation. The magnetic process of writing and feeling the results is the kind of thing that can shift us from ho-hum to ho-ho-ho! As much as I love this article, I love even more that you called me your friend. artist. author. strategist & speaker. I agree with Steve! A fantastic and unique post. What is your wish list for life? And why were all our Christmas wish lists about getting material things? Even by the age of 5, I’d been thoroughly indoctrinated into the consumer lifestyle. After this x-mas, when I give gifts to nephews/nieces they are going to be donations in their names to something that matters or something non-material. So much of this junk clogs up our landfills. If I’ve missed a material present or money for whatever reason, I’ve gotten the word through others that it wasn’t acceptable. You must go along with the generic program. Why? I wish that folks everywhere could wake up to the power and gift of their own lives. Thank you Lisa! Enjoy … G.
Hmm, that is a bit tougher than I thought. Just what do I wish for? i will ponder this as I work in the flower beds tomorrow. Thankx for the food for thought, Lisa. Thank you, Teresa! What I have found in working with women is that it’s often very easy to know what we DON’T like or want in our lives, yet often way more difficult to define what we DO want. Spending time thinking about what we loved to do and how we spent our time as a child can open up some dreams that may have been packed away for years. And, new possibilities can spring forth in the New Year.